Broken English Club / Claus Fuss - Citrinitas Edition. Vinyl 12. Bleep. London’s Khemia Records fronts two pieces of 90s-flavoured techno here. 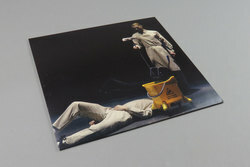 Broken English Club’s ‘Thee Art Ov Metals’ finds a pleasing midpoint between Peder Mannerfelt’s recent lo-fi rave output and the Gorillaz/Mark E Smith collaboration ‘Glitter Freeze’. Introducing itself with a taut drum groove, the track morphs into an industrial techno juggernaut with the addition of a machine gun bassline. Claus Fuss runs with the theme on his offering ‘Static Ace’. Over more than ten minutes, Fuss spins out a hypnotic bleep loop into a piece of potent dancefloor goodness, merging it with a drum track that spends a couple of minutes getting its act together before locking into a hard-as-nails four-on-the-floor.